That is the best description for the day. Seriously…where did the weekend go? We started with the ginormous fish sandwiches Friday. Had a wonderful Saturday spent with friends and their baby girl. 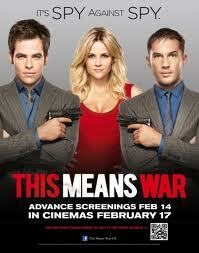 There was the Saturday night movie to see “This Means War” – we really liked it. Lauren: Okay, let me think, flaws. FDR has these tiny, like girl hands, like little T-Rex hands. Lauren: And Tuck is British. Tuck: What is that supposed to mean? I love Reese –she plays Lauren – (some of you may recall the “I want Reese’s bangs” rambling) and it is pretty easy to be mesmerized by Chris Pine’s eyes. Go ahead – deny it and I’m calling you a liar! And then of course there are the shopping Sundays. Which is then followed by me spending most of the remainder of the day cooking meals for the week. This week I made Chicken Meatball Soup and Beer Risotto with Mushroom Garlic Chicken (minus the mushroom). When I woke up this morning – I really asked “Where did the weekend go!?? !” It was a horrible feeling – especially knowing that I will be working late on Thursday and Friday. And I am the only one feeling like spring is here already? I decided to take a walk after lunch today…it was SOOOOO nice out! But then I quickly remembered why I tend to stay inside during the work day. a) There are scary people out there! b) I went for a walk to get some fresh air and ended up bringing back a new pair of shoes. How does that happen?!?! But that doesn’t surprise me. I mean it is part of the reason why I am writing Shop Good – Do Good. I love to shop! And I love to help people. And I love to discover new companies and products that love to help people, or the environment, or animals, or even better all of it! They have a ton of super cute things for women and men. I think I would be happy with almost one of everything they have! Oh – and don’t forget about their accessories – there are a lot of great bags, hats, and scarves too! And of course to make them even better – they are a very socially responsible company. Take a minute during your lunch break or on your commute home (as long as you aren’t the one driving!) and see what you would add to your must-have list! P.S. Be sure to look at the Sale portion of their site – there are some great deals!